Meet our world class 316 Ti-Alloy, lightweight, stainless steel relining system. Its superb features, great price, transferable lifetime warranty, and the HomeSaver name set it apart from all other liners. The engineers at HomeSaver have designed a mechanical, gas tight roll lock system with unique corrugations which combine to make this a strong , light, user-friendly liner like no other. 316 Ti is the best all fuel alloy we know of. It resists corrosion under acidic and high-heat conditions better than anything else, yet it is light, flexible, and easy to work with. Use it for wood, pellet, oil, coal, and category 1 gas applications. HomeSaver Pro carries an uncompromising lifetime warranty. It is designed and manufactured to the same exacting standards as all of its relatives in the HomeSaver family. The transferable lifetime warranty covers mechanical failure, corrosion, and damage caused by chimney fire for all fuels (gas is limited to category 1 appliances). All HomeSaver liners come with a transferable lifetime warranty. That means, if you sell your house, the lifetime warranty is transferred to the new owners! Only HomeSaver dare place a warranty like this on their liners, they are simply The Best! 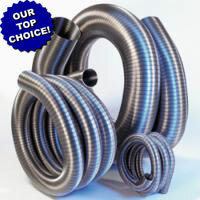 Insulated HomeSaver Pro is UL listed to the 1777 Standard for zero clearance in 3"-12" diameters. Insulate with our 1/2" Foil-Face FlexWrap to meet the UL 1777 Zero Clearance listing. Heavy duty 18 ga. Top Plate, Top Clamp, 24 ga. Storm Collar, and Cap, plus the top quality Tee and Tee Cover, all come with the kits, but are also available individually. The picture of the kit shows the fittings that come with the kits. Compare our HomeSaver reline products with the other brands...... if you can. Many of the other companies don't even list their specs anywhere. Compare stainless steel component thickness', like top plates, Tees, caps, etc.. Compare our product and tech support to theirs; Can you talk to a live person or do you have to type out email questions and wait for a reply. Hart's Hearth free Product and Tech Support will get on the phone with you and help you step by step in choosing what you need and how to install it (support policies). We believe that you and your family's safety and peace of mind should be the number one priority. Compare price; ours might be slightly higher, but it is because of the superior product quality and never ending support, yes, we said never ending. If a question EVER arises about anything to do with your wood or coal burning device, we will be here to help you with an answer, Live!